Nuclear factor kappa B (NF-kB) is one of the most important transcription factors whose modulation triggers a cascade of signaling events, namely the expression of many cytokines, enzymes, chemokines, and adhesion molecules, some of which being potential key targets for intervention in the treatment of inflammatory conditions. The 2-styrylchromones (2-SC) designation represents a well-recognized group of natural and synthetic chromones, vinylogues of flavones (2-phenylchromones). Several 2-SC were recently tested for their anti-inflammatory potential, regarding the arachidonic acid metabolic cascade, showing some motivating results. In addition, several flavones with structural similarities to 2-SC have shown NF-kB inhibitory properties. Hence, the aim of the present work was to continue the investigation on the interference of 2-SC in inflammatory pathways. Herein we report their effects on lipopolysaccharide (LPS)-induced NF-kB activation and consequent production of proinflammatory cytokines/chemokine, using a human monocytic cell line (THP-1). 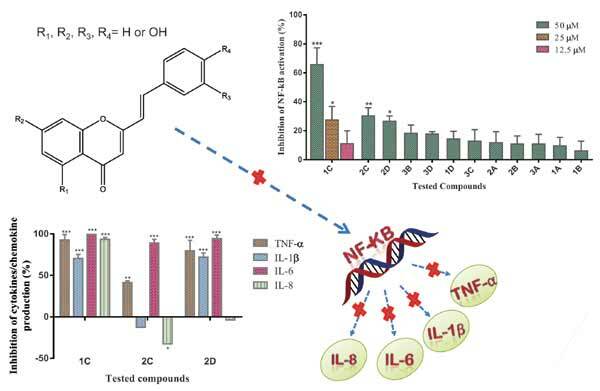 From the twelve 2-SC tested, three of them were able to significantly inhibit the NF-kB activation and to reduce the production of the proinflammatory cytokines/chemokine. The compound 3’,4’,5-trihydroxy-2- styrylchromone stood up as the most active in both assays, being a promising candidate for an anti-inflammatory drug. Inflammation, Nuclear factor-κB, Pro-inflammatory cytokines, Styrylchromones, THP-1 monocytes.